It may have simply been the final chapter in the so-called silly season for the British national press, but a possible sighting off the Pembrokeshire coast of a Great White shark was enough to hook the headline writers. The story, accompanied by a grainy mobile-phone shot of a creature emerging from the waters near Caldey island, brought local David John his 15 seconds of fame and some welcome publicity to a popular fishing destination. Not that the waters around the UK need much promotion when it comes to attracting sea fishermen in search of some serious sport because even the most cursory glance around the internet will yield a wealth of choice. Those with disposable income to blow don’t even have to restrict themselves to British shores because the list of worldwide destinations has been steadily growing, transforming what was once a gentle way to wile away an early morning into an adrenalin packed pastime that can hold its own with even the most extreme of extreme sports. Whoever thought that your rod could provide the passport to new horizons? Or introduce you to new faces eager to swap stories and perhaps a few tips? Fishing may still be viewed as something of a minority sport, but the worldwide community that shares a passion for it has never been better served by the travel industry. There is a range of packages designed to reel in as many punters as possible, featuring accommodation from the more basic to the luxury, with permits included on protected lakes and rivers. Families and non-fishing partners are also catered for; you don’t always have to be an experienced or highly skilled angler, either, because breaks are available to suit a range of abilities. The more cynical would say that this is not surprising because the companies are attempting to cast their net as wide as possible in order to haul in as much cash as possible. Well, of course that is very true. 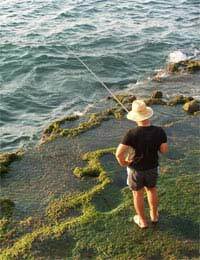 But the pay off for fishing enthusiasts is more choice and, therefore, more fun. All this excitement doesn’t come cheap in many cases, but whether your interests centre around coarse fishing, sea fishing, fly fishing, or simply the opportunity to spend a few hours in a boat before retiring to the beach to enjoy the rest of the day with the family, once in a lifetime experiences are now within reach. Head for Kenya, for example, and your rod time can be supplemented by a safari that allows you to see some of terra firma’s natural wonders. By contrast, you are unlikely to bump into a cheetah in northern France, but the local lakes offer a seductive mix of beauty and tranquillity. Then again, you may want to settle for bed and breakfast accommodation in Pembrokeshire. Already a popular location for sea fishing, the publicity surrounding the Great White is bound to increase the number of visitors. Whether you get rather more than you bargained for at the end of your line is another matter. But even if it is only a turbot, bream or ling that you reel in, you’ll return with enough memories to last you until your next trip.